(Bakersfield, CA) – The George’s Treehouse interactive exhibit at Eagle Oaks Specialty Care Center in Bakersfield recently won a Gold award by Horizon Interactive Awards in the “Interactive – Kiosk/Public Exhibit/Museum” category. The awards recognize excellence in interactive media production and accepted more than 10,000 entries from all 50 states and 40 counties. 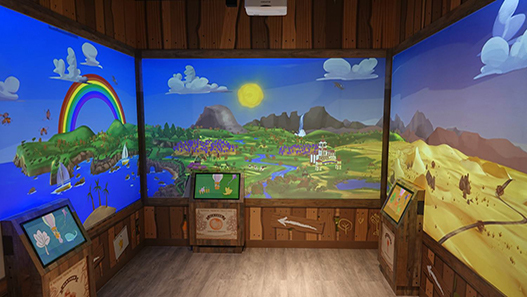 Opened in October 2018, George’s Treehouse at Eagle Oaks is a room young patients and visitors can enter that has three walls of interactive monitors. At kiosks, kids can customize characters, or a hot air balloon full of characters of their choice. Once selected, they can watch as their creation floats over the local landscape. Planning for George’s Treehouse began long before Valley Children’s broke ground on the site of Eagle Oaks. Patient and family focus groups convened to brainstorm interactive art exhibits throughout the center, with the goal of creating a welcoming, family-friendly experience and alleviating anxieties through creativity, wonder and play. Learn more about Eagle Oaks Specialty Care Center at valleychildrens.org/eagleoaks, and click here to watch a video about George’s Treehouse.